The journey through insurance investment strategies is ending. Investors could be tempted by high-yield common stocks, which are undercovered by most of the analysts. Sometimes, the best strategy to preserve capital is simply to not chase yield. Let's take an in-depth look at two high-yield reinsurers: Maiden Holdings and Blue Capital Reinsurance Holdings. Two different situations, but the same bad ending for their shareholders. Thanks to strong leading positions in niche markets, some of them are able to generate recurring and resilient cash flows which are redistributed over the years to the shareholders. DGI investors usually consider these stocks as very safe investments. As written in the second part of the series, other investors (e.g., pre-retirees or retirees), who look for higher yield, might be interested in baby bonds or preferred stocks issued by insurers. These financial instruments are often issued to meet regulatory requirements in terms of capital position. Hence, insurers are eager to meet their financial obligations to avoid being downgraded by rating agencies, losing clients or being obliged to set up an action plan required by the regulator. Finally, some investors might be tempted to look elsewhere and search for under-covered stocks, which are traded below book value and offer a juicy dividend (more than 8%). High-yield common stocks in the insurance industry can be very tempting. However, due to the significant operational float-related leverage typically involved, these securities need to be very thoroughly researched. Less-than-normal position sizes are usually called for. Sometimes, the best strategy to preserve capital is simply to not chase yield. Maiden Holdings (NASDAQ:MHLD) is Bermuda-based reinsurer, founded by AmTrust's founders, the Karfunkel family by initially reinsuring some businesses written by AmTrust. During the last ten years, Maiden has expanded both organically and externally via acquisitions (in 2008 and in 2018, they acquired, first, a reinsurance platform and, then, an international insurance business). Thus, in almost ten years, premiums have grown more than 10-fold, from $247 million to nearly $2.8 billion, despite maintaining a relatively low, even for a reinsurer, employee count. The company started paying a quarterly dividend in 2008 (price $3.25) and increased its dividend level each year until 2017. By mid-2017, the stock price was around $18, a 5.5x increase plus dividends paid. However, by December 2017, when I decided to invest in Maiden, the stock price had plummeted to about $6 with a very attractive yield for an insurer, about 9%. In other words, I got suckered in by Maiden's high yield, and though I eventually realized my mistake and cut my losses, I also paid the price. Today, Maiden trades for less than $1. My mistake was in not adequately judging Maiden's reserves despite being an actuarial professional myself. Maiden had taken large workers' comp losses in prior years, losses which with most insurers would have already been reserved even over-reserved for due to the conservative nature of the business. However, I did not understand Maiden management and underwriters were apparently not as conservative with estimates as other insurers would typically be. Despite knowing the problem for quite a while, they still had not adequately reserved. The situation continued to deteriorate further, the dividend was cut, and book value declined. For a while, I continued to believe that Maiden could restore its margins and kept my shares, but I was a fool. The situation worsened again in 2018, in spite of the company's announcements to sell some subsidiaries to improve its overall financial situation. Luckily, I had already taken my losses and moved on. Sometimes, an education is what you get when you didn't get what you wanted. Here, I gained experience by "getting educated" that not all insurers are run by responsible and conservative management. 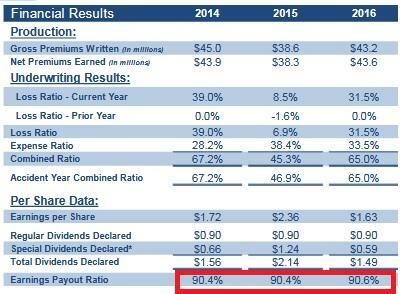 Blue Capital Reinsurance Holdings: An Unstable High-Yield Common? 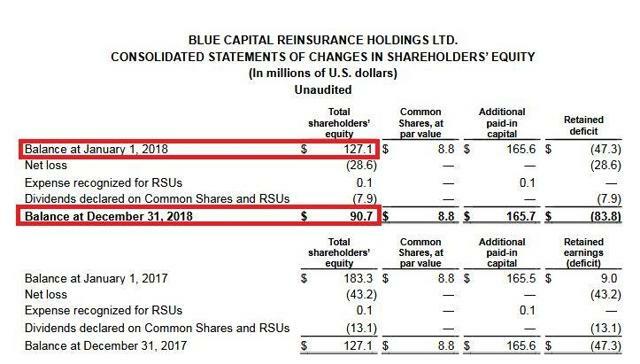 Blue Capital Reinsurance Holdings (NYSE:BCRH) is a Bermuda-based reinsurer, in which Sompo International, a respected Japanese non-life insurance and reinsurance carrier, recently made a 33% strategic investment. I should be clear up front its problems stem from before Sompo took over, specifically Hurricane Irma. 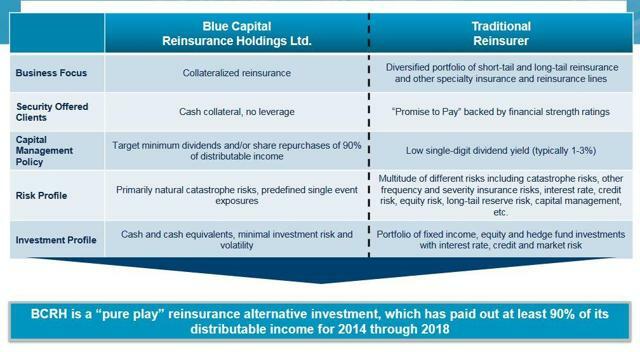 Blue Capital is a reinsurer, which provides, according to its own statements, investors with a return profile uncorrelated primarily to financial markets. So far, so good. The company provides unique access to traditional and collateralized reinsurance markets, limited financial market exposure, and targets to distribute at least 90% of its distributable income. That sounds pretty good, too. And, before 2017, the regular dividend was more than covered, as the claims situation was favorable, with catastrophic events remaining within expected acceptable limits. However, in 2017, the U.S. was hit by several hurricanes, Harvey, Maria and Irma, which affected the entire insurance industry adversely. In fact, 2017 was one of the most expensive catastrophe loss years in industry history with Hurricane Irma, in particular, negatively affecting BCRH. Irma essentially was a worst-case scenario for BCRH, hitting very near its maximum liability amount. Initial losses and reserve projections taken were bad, very bad, but even these turned out to be underestimates. 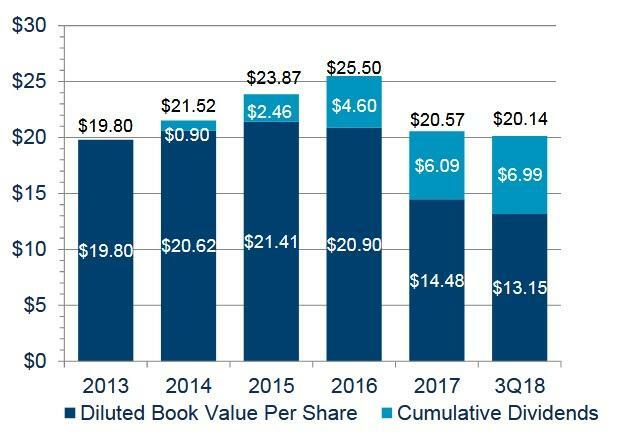 Book value declined, yet strangely, the dividend was initially maintained. Then, unfortunately, the situation did not improve in 2018 as planned. 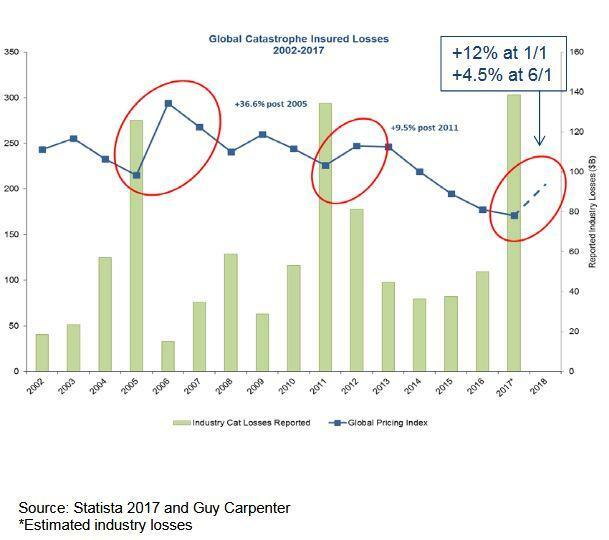 Lingering Irma losses exceed historical precedence, causing the company to be adversely affected by unfavorable prior-year claims development (e.g., late claims, claims reopening, etc.). Thus, the company seemed a deal in 2018, trading at .8x book value or less, with Irma already reserved for and hurricane insurance rates up double digits. However, ultimately, Mr. Market was proved right, additional claims came on previous events (Irma), and the book value continued to decline. Management eventually made the right call in cutting the dividend in half to 15¢. With this decision, book value should be more stable. However, in the near term, I remain pessimistic on Blue Capital's situation, noting too much money seems to continue to be attracted by non-correlated returns. Rates did not increase as much as I thought warranted in the latest pricing; and, I want confirmation uncharacteristic follow-on claims from Irma are finally behind us. 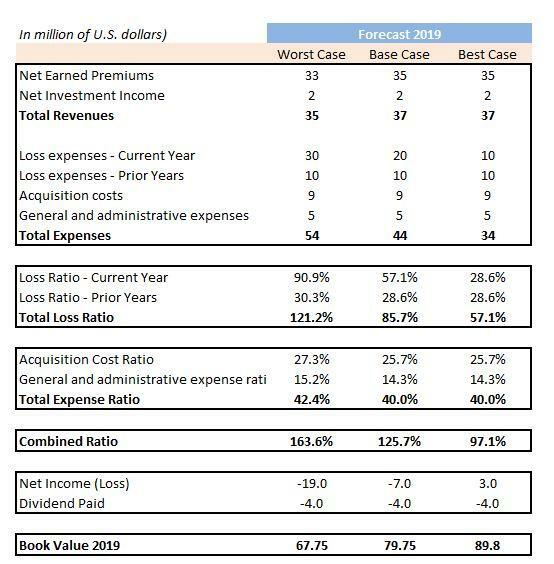 Hence, my current estimate is BCRH's book value should end 2019 somewhere between $68 and $90 million ($7.75-10.25), a fairly wide and uncertain 1-25% decline from the current $10.35 book value. While, at the current $7.05 price, BCRH's represents somewhere between a 13% and 35% discount to estimated 2019 book, and an 8.5% forward yield, I remain concerned. My and management's estimates on continuing Hurricane Irma related losses may continue to prove incorrect, and/or the industry may simply not be charging enough for Gulf Coast hurricane insurance. It's possible I am showing too much conservatism with BCRH, but the whole idea of the insurance portion of my portfolio is lower overall portfolio risk via diversification, not to raise it. Understanding insurance companies might be complicated. They might write very complex policies or provide insurance coverages which could develop unfavorably in the future if they are not appropriately underwritten. As I wrote in my other articles, robust and sustainable operating performance remains the critical point of insurers' business resilience. For example, I made more money with Aflac (AFL) than with Maiden Holdings, while I considered that the potential upside was more significant with the latter. Sometimes, keeping it simple is the most effective strategy to preserve your capital. The CrickAnt is now covering insurance for Cash Flow Kingdom, "where Cash Flow is King". 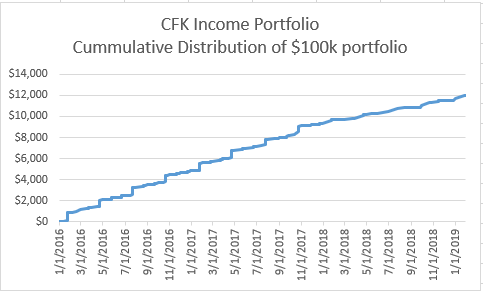 From inception (1/1/2016) through January 2019, the CFK Income Portfolio accrued total return* of 50.2% (vs. 46.8% for S&P 500, 32.3% for Russell 2000). Average portfolio yield is currently 9.6%. Cash Flow Kingdom welcomes The CrickAnt as a contributing author covering insurance (equities, preferred, and bonds). Cash Flow Kingdom, "The Place where Cash Flow is King"